Lord Byron : Childe Harold, 1911. Byron, Lord: Childe Harold's Pilgrimage. Volume 2, Number 2, August,1911, front piece. An example of "surfing" themed poetry, an often reproduced except from the famous English Romantic poet known for his enthusiasm for the ocean and swimming, notably his swim across the Hellespont in 1810. Illustrated with a photograph from the surfing photographer, A. R. Gurrey, Jr., whose work was reproduced in many early editions of The Mid-Pacific Magazine. The poem also appeared in A.R. 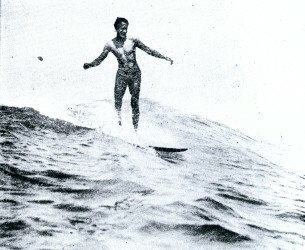 Gurrey Jr.'s Surf Riders of Hawaii. A.R. Gurrey Jr., Honolulu, 1911-1914, page 3. The Byron quotation was followed two issues later (Volume 2 Number 4) with a poem by John M. Giles titled Surfing. 1911 John M. Giles : Surfing (a poem). Extract from The Mid-Pacific Magazine, Volume 2, Number 4, October,1911, pages a and b. "George Gordon Byron (22 January 1788 – 19 April 1824) was celebrated in life for aristocratic excesses including huge debts, numerous love affairs, and self-imposed exile." "In 1810, Byron swam across the Hellespont (the Dardanelles), at the narrowest point a little over 1 kilometer across. His inspiration was the Greek myth of Leander who every night swam the straits to see his lover, Hero, who would hold a torch from atop a tower, to light his way. During a violent storm Leander drowned and, witnessing his death, Hero threw herself from the tower into the sea." "Childe Harold's Pilgrimage was published in 1818 (text on Wikisource) was published between 1812 and 1818 and is dedicated to "Ianthe", the term of endearment he used for Charlotte Harley (the artist Francis Bacon's great-great-grandmother). The poem describes the travels and reflections of a world-weary young man who, disillusioned with a life of pleasure and revelry, looks for distraction in foreign lands; in a wider sense, it is an expression of the melancholy and disillusionment felt by a generation weary of the wars of the post-Revolutionary and Napoleonic eras. The title comes from the term childe, a medieval title for a young man who was a candidate for knighthood. The selected passage is from Canto IV, Stanza 184." Extracts from Byron in Hawkesworth: Voyages in the Southern Hemisphere, (1773), Volume 1? Extracts from Voyage of the 'H.M.S. Blonde' to the Sandwich Islands in the Years 1825-26. John Murray, Albemable Street, London. 1826. Pages 97, 137 and 138, 166, 206 to 209. Were a delight; and if the freshening sea. Photo by A. R. Gurrey, Jr.
Volume 2, Number 2, August,1911, frontpiece. Geoff Cater (2011-2016) : Lord Byron : Childe Harold, 1911.